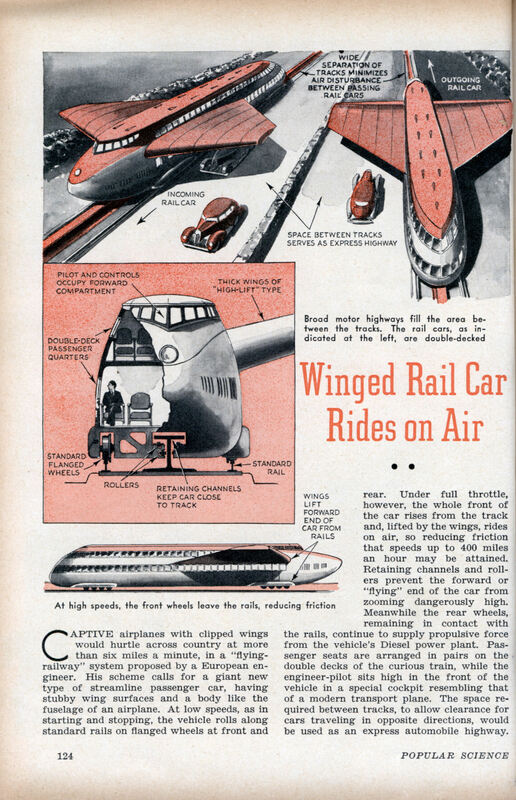 Imagine a 400 MPH Monorail/Bullet Train, in Crimson Skies style! A winged train, using ground effect to "Fly" and a "T" rail to hold it down! Conventional rails are added for lower speeds, so I guess it is actually a "Trirail" rather than a true Monorail. Still though, way effing cool! I can picture these working in the ISA, The Empire State and Hollywood along what is today known as the I5 corridor. In my opinion (of course) a 400 MPH train would create too much turbulence ('specially two of them passing each other!) for automobiles, so I really cannot imagine them sharing highway space! Still though, a very cool (though whacky) idea well ahead of it's time.